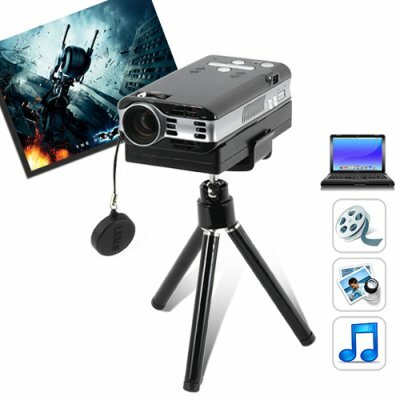 Successfully Added Pico Pro - Mini Projector For Laptops (VGA, SD, A/V, 800x600) to your Shopping Cart. Introducing one of the brightest mini projectors on the market, the Pico Pro. The Pico Pro is an extremely well built machine. Yes- its attractive design and strong build quality are much better than similar projectors, but it’s what’s inside that really matters. Inside is where you’ll find the ultra-efficient optical engine, new LCoS chip, and high-power LED to achieve a stunning 30 lumen output at 800x600 resolution. What does all of this mean? Excellent quality images- even in environments that are not very dark. When used in darker environments, the Pico Pro produces spectacular quality images up to 80 inches diagonally! If image quality and brightness is a concern, then the Pico Pro is sure to satisfy your needs. At about the same size as an iPhone but slightly thicker, this mini projector fits easily in to any jean pocket or briefcase and is the ideal solution for business people on the go. Unlike other mini projectors, the Pico Pro actually displays clear and legible text, making it perfect for Power Point presentations and business meetings. The Pico Pro comes with a built in VGA connector for connecting to any netbook or laptop computer, a Micro SD slot and 2GB internal memory to store and play all your favorite media files, and an A/V input to connect devices such as Video Game Systems, DVD players, HDD Media Players, and even portable media players like MP4 Players, Zune, iPod’s, iPad's, and even the iPhone (with an additional AV cable - not included). This mini presentation projector isn’t cheap. However, if you’re looking for the ultimate portable projector with professional features like SVGA 800 x 600 resolution, 1000:1 contrast ratio, LCoS chip, 30 lumen output with 40-45 peak lumens, and multiple playback options, then this mini projector is actually relatively inexpensive. Similar models like the 3M MPro150 retail for more money and have half the lumen power of the Pico Pro, or the AAXA P2 Pico that is basically a rebranded Pico Pro, but more expensive, with half the internal memory, and with a weaker battery. And unlike other mini projectors, the Pico Pro comes with a full 12 month warranty and is in stock in our warehouse right now. Order today and we will express ship out your order tomorrow. Yes, the Pico Pro is perfect for watching movies, even if lighting conditions are less than ideal. The projector is hot, is this normal? When turned on, the projector is waiting for VGA input. If you hold the "play" button for a few seconds, it will switch into media player mode and you can play your media files from the internal memory or external micro SD card. Hold "play" for a few more seconds and it will go back to projector mode. on 2010-05-29 20:33:27 Very Nice! This Projector has a very good picture. With low light it is decent, but in a dark room I must say that it is excellent. I watched a movie outside (projected on the side of my house - white wall) and got a clear sharp picture (at night) over 2 meters across! (The unit is very simple to set up). The built in speakers simply are not enough. I would suggest using external speakers (like the "hamburger" speakers available on this website). The fan isn't near as loud as I expected and with external speakers connected it is completely un-noticeable. One drawback is that playing movies from the internal memory with the onboard media player is not very good. It seems to be slow and the sound is not in sync with the picture unless it has been converted to exact specifications. I was able to get around this problem by copying the movies to a micro SD and then using the "explorer" (in the menu) to play them directly from the SD. By doing this, I could play all of my downloaded AVI files perfectly with no need to convert at all! (You will have to purchase a mirco SD as one does not come with the unit). Connected to a laptop via the VGA cable (included) the unit also produces an excellent image. It can be used as a second monitor and you can watch anything that your laptop can display through the projector. The image is sharp enough so that even small text is easily readable. If you are looking for a small portable projector, then this is probably the best one by far in its price range.